Evidence of a fragile snow pack! Yesterday’s storm has exited on SE flow & we are now seeing the beginning cirrus formation moving into our mountains on WSW flow setting up for the next storm beginning in the high country late tonight/early Monday morning. A large low pressure trough is moving into the Great Basin today and by tomorrow morning it will spin warm subtropical Pacific moisture into the SJ’s. This first portion of the storm could bring 4-8″ to the southwest facing terrain above TL. 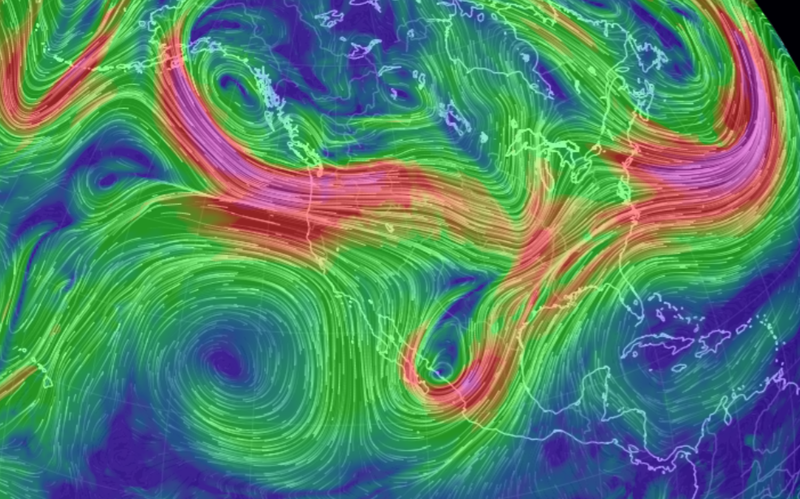 Late Monday the trough pinches off into a closed low and moves back towards California (retrogrades) with a resulting split flow (A upper level high pressure positioned over a low pressure beneath or to the south forming a Rex Block that directs winds from east to west). The location of this block puts the San Juans in good position for more snow possibly between 5-10″ into Tuesday. Winds decrease a bit with the split flow so it’s difficult to forecast exact snow totals for a given time and region but maybe we should be feeling lucky the next few days.